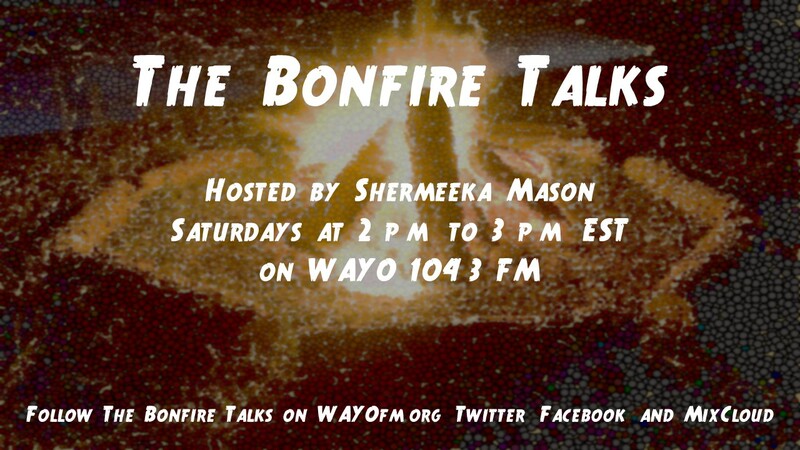 The Bonfire Talks | WAYO 104.3FM Rochester, NY | Way out, right here. Hosted by Shermeeka Mason, "The Bonfire Talks" is a podcast dedicated to promoting intellectual discussions on various topics. On this episode, Fred Douglass and I will be discussing the pardon of Joe Arpaio and the Marvel hit series The Defenders. On this episode, Hosts Shermeeka and Now's The Time's Frederick Douglass discuss Charlottesville, the aftermath, and the ketchup debate. On this episode, Host Shermeeka Mason invites Kryptic Pop Thrills Host Kameron Ackerman talk about and exchange music! On this episode, Hosts Meeka and Now's the Time's Frederick Douglass discuss Disaster 45's military ban and the remake of Stephen King's "It." On this episode, Hosts Meeka and Now's the Time Frederick Douglass pay homage to Linkin Park's Chester Bennington and wonder why Walmart employees are wearing capes. On this episode, Host Meeka welcomes Rochester filmmaker Rasta Von to the show to discuss "Judgement Night," a film featuring the late local legend Hosea Taylor, Jr.
On this star studded episode, Meeka, Fred D., Afro Latina Queen, and Irene Kannyo discuss the death of Dejuan Guillory and Strawberry Baked Beans. On this episode, Rochester Poet, Mentor, and Hip Hop Artist Chi TheRealist discusses his passion and love for the written word. Features his song "Heart of the City." On this episode, Rochester Editor Willow Green and California Poet Fred Dodsworth discusses "11/9: The Fall of American Democracy" and many other topics. Features an original piece by Fred Dodsworth. On this episode, Activists Cat, Milo, and Justin discusses the works of Street Medics and the misuse of the Free Speech argument.